[prMac.com] Cambridge, UK - Against an ever increasing number of photo book services, FotoInsight is increasing its technological lead with the introduction of version 4.5 of FotoInsight Designer, which today is launched for Linux and Mac. The ease at which photos can freely be inserted into the book or into templates now also extends to clipart, maps, text and images from photo sharing sites like Flickr as well as the geotagging site "locr" and Wikipedia GeoNames. The photo sharing sites become an online interface for photo book building with family and friends, as users can now complement their printed photo albums with additional pictures (e.g. the Eiffel Tower form a different angle) from photo sharing sites, straight from within the FotoInsight Designer software. In addition, with just a mouse click pictures used in a photo calendar or photo book project in FotoInsight Designer 4.5 can be uploaded to the geotagging photo community "locr". The other way around, aerial shots and maps from the geotagging community will come handy for comprehensive information of the locality in a personal travel book. "locr GmbH's" Managing Director Malte Schloen states: "The collaboration between the FotoInsight Photo Book service and locr as a geotagging and information sharing site combines two innovative leaders to the benefit of users. Geotagging communities like 'locr' free internet users from Ordnance Survey's outdated geographic information monopoly." FotoInsight's Managing Director Klaas Brumann adds: "We are so excited that our software tool for photo book design now integrates a gateway into shared photos and geographic information and online photo sharing, that we are already working on extending the range of photo sharing sites to also include Facebook and Picasa in the following release later this year." For geotagged images the new software can load corresponding local information straight from "locr" or Wikipedia into the photo book. Creating area maps takes just a click. FotoInsight's Head of Communication Catalina Mart�nez states: "It has never been easier to write comprehensive travel diaries or even your own travel guide." Using geotagging applications for photos or tagging the location information manually opens a new world of opportunity to relate images with locality information. According to FotoInsight "layering images in any order or position has been one of the outstanding features of its Designer software for photo books". With the new software upgrade a range of different shapes or blend-in image masks can be used as image frames. There are also plenty of new frames and clipart to decorate photo gifts for Mothering Sunday, Easter, Father's Day etc. After extending its range with the Photo Book XXL with editable hardcover in portrait format (H36 x 28 cm) and in faux leather with traditional screw bind in panoramic format (H30 x W42 cm) last year, FotoInsight is now adding an A4 panorama size (H28 x W21 cm). FotoInsight's print resolution of 360 dpi produces crisp panorama images spreading across double pages up to 84 cm wide. The Easter holiday photographs are a great opportunity to try the new FotoInsight Designer features, printing photographic memories. Therefore FotoInsight offers 10% off all photo canvas print (voucher CNV1) and a square photo book (21 x 21 cm) for �10 (saving �4.99; voucher code PBSS1C, expires 30 April 2009). 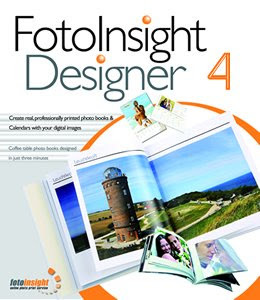 For questions or if you would like to test the FotoInsight photobook software "Designer" as a journalist please contact us at tel. +44 (0)8700 114911. FotoInsight also offer vouchers and software for reader offers. FotoInsight Ltd was founded in 2003 in Cambridge and runs an easy to use digital photo processing service, offering an extensive array of award-winning photographic print and photo gifts as well as the photo books, photo poster, photographic calendars and photos on canvas printing. Customers benefit from patented development processes and the experience of Europe's largest independent photo lab with an installed capacity of 18 million prints per day. Photos ordered through FotoInsight are developed in one of 19 strategically located, state of the art photo labs, employing 3000 staff, with an output of over 3 billion prints per year.